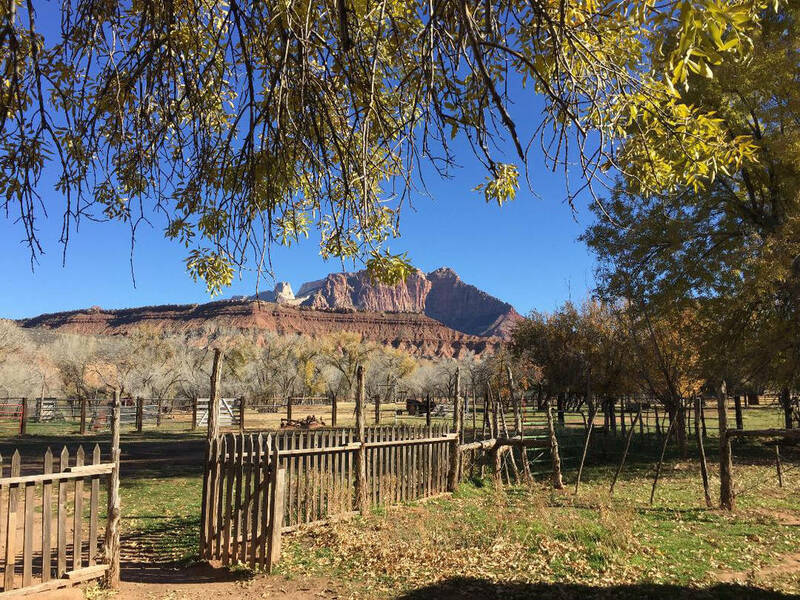 Grafton, Utah, located about 20 minutes before the main entrance to Zion National Park, is a pioneer town established in 1861. Deborah Wall The Grafton Schoolhouse/church was built in 1886 of rustic adobe on a foundation of lava rocks. The abandoned town is about 20 minutes away from the main entrance to Zion National Park in Utah. Deborah Wall Looking north from the historic Grafton town site in Utah you can see Zion’s Mount Kinesava. This historic site is on the National Register of Historic Places and is well-preserved thanks to the Grafton Heritage Partnership Project. It was originally about 1 mile downstream, but a severe flash flood along the Virgin River in 1862 destroyed the town. Townspeople rebuilt in the current location that same year. Being near the banks of the Virgin River, Grafton has some of the best views of the western part of Zion. In the town site you will find fruit orchards, meadows, historic buildings and even a cemetery. The pioneers had it tough here. 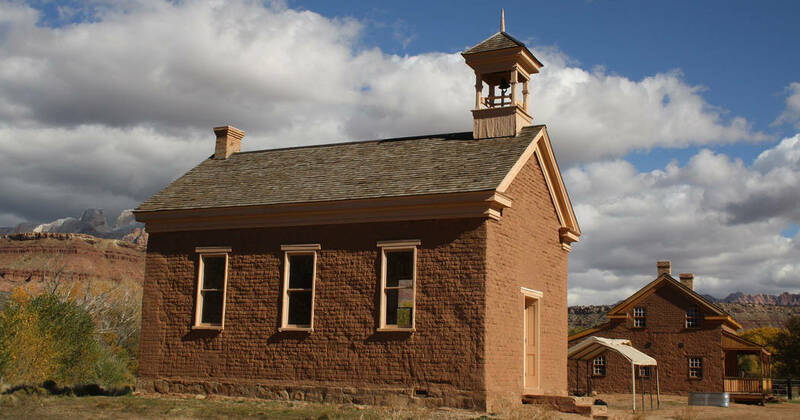 In 1866 alone, this small hamlet buried at least 11 people in the local graveyard; six people were killed by diphtheria, two teenage girls by a freak accident and three by Navajo raiders. The cemetery, about one-third of a mile from the town site, is thought to hold more than 74 graves, many unmarked, their occupants buried from 1862-1924. By 1906, almost all townsfolk had moved downstream to Hurricane. There were a few holdouts, but by 1945 all had gone. Before you set out to explore, pick up a self-guided tour booklet near the fence in the front of the 1886 schoolhouse/church. You will need 30 minutes to a couple of hours for visiting the entire town site. If the scenery looks familiar to you, think of the iconic and funny scene from “Butch Cassidy and the Sundance Kid.” Cassidy (Paul Newman) rides a bicycle and tries to impress Sundance’s gal, Etta Place (Katherine Ross) with his bike skills. The background music established “Raindrops Keep Falling on My Head” as one of our time’s most familiar tunes. Grafton is about 3,678 feet in elevation, so expect it to be about 5-15 degrees cooler than Boulder City. There are no services, so bring food, water and such. For more information check out www.Graftonheritage.org. From Boulder City, take U.S. Highway 93 26 miles to Interstate 15 north. Drive for about 135 miles to Utah State Route 9 (Exit 16 Hurricane/Zion National Park). Follow Utah 9 east for 27 miles to Rockville. Go right at Bridge Street. Cross over the one-lane bridge and follow the road for about 3.5 miles, staying right when in doubt, until it dead ends. The route is paved at the beginning, then becomes a well-maintained gravel road, suitable for most passenger vehicles except after or during rain or snow.